Northern Ireland is a good place to see the Aurora Borealis, or Northern Lights. Not, perhaps, as good as Iceland, Northern Norway or Alaska, but if you happen to live here good displays can be seen and armed with a little information it is possible to plan a trip out with a few hours advance notice. The best place to start is with a good location. It might, in extreme cases, be possible to see the lights from Central Belfast but it will be a far from ideal experience and you'll always be better off leaving the city in search of better skies. The North Coast and spots along the Antrim Coast Road are generally good. You're looking for a clear north horizon away from sources of light pollution. It doesn't have to be looking across the sea though that is generally a good option. 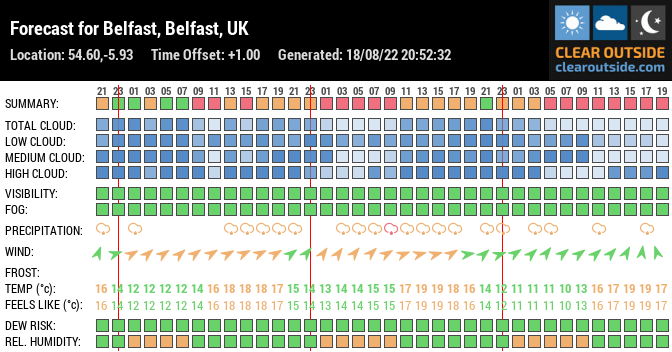 You'll need good sky conditions and the chart below gives you a clear sky forecast for Belfast which is generally a good indicator for most of the province, but if you want to be more specific clicking the chart will take you through to a site where you can enter your co-ordinates, town or postcode to get more specific results. Generally, we're looking for green along the top line. Next, we need to know whether there is potential activity or not. The Aurora is driven by a complex interaction of paticles from the Sun, the Solar Wind, and the Earth's magnetic field. The wind is driven by such events as exploding sunspots causing Coronal Mass Ejections (CMEs), and other phenomena such as Coronal Holes. The arrival of such events at Earth can be detected by Magenetometers and the charts below show current and recent actvity as measured by magnetometers in Scotland and Lancashire - close enough to us to give an indication of the local circumstances. Next up is the Kp Index. This is a measure of overall geomagnetic activity in the upper atmosphere. It ranges from 0, which is no or very little activity, up to 9 which is the highest level of geomagnetic storm, rarely seen. Geomagnetic Storms are what we want to hear about when seeking out auroras and they range from G1 to G5, corresponding directly to activity levels of Kp5 to Kp9. Some will say that from Northern Ireland's location it's unlikely that we'll see an aurora with a Kp less than 5 or 6, the fact is that Kp and Bz work together so that a favourable southerly Bz can produce an Aurora display even if the Kp is only 3 or 4. 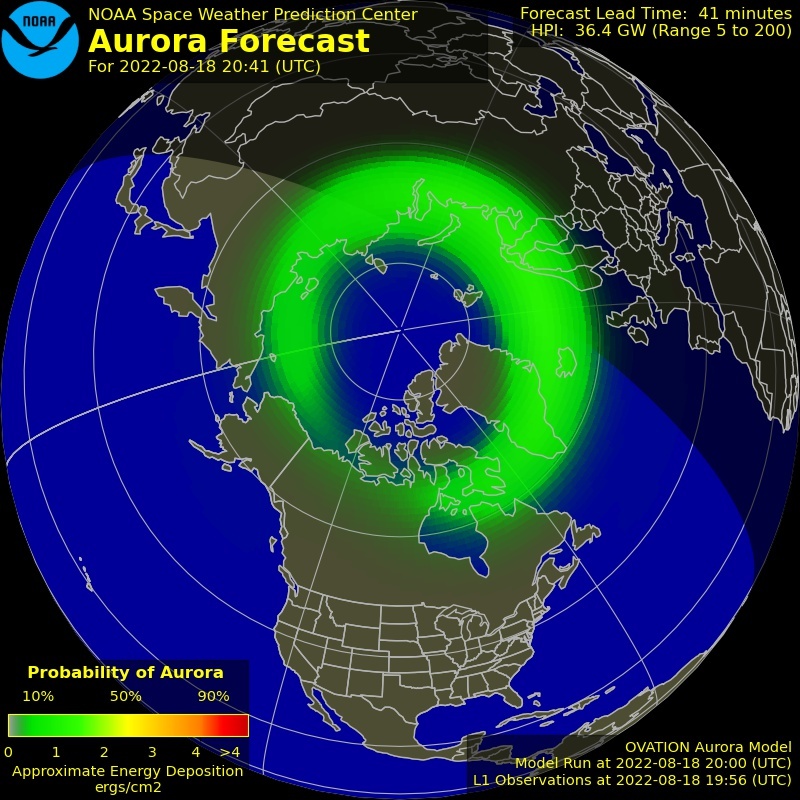 This below is the OVATION-Prime model Aurora Forecast depicting the Auroral Oval and is probably the easiest to understand. It depicts the predicted aurora usng data drawn frm numerous sources. What we're looking for of course is plenty of orange or red with the red line of visibility heading down towards Ireland!